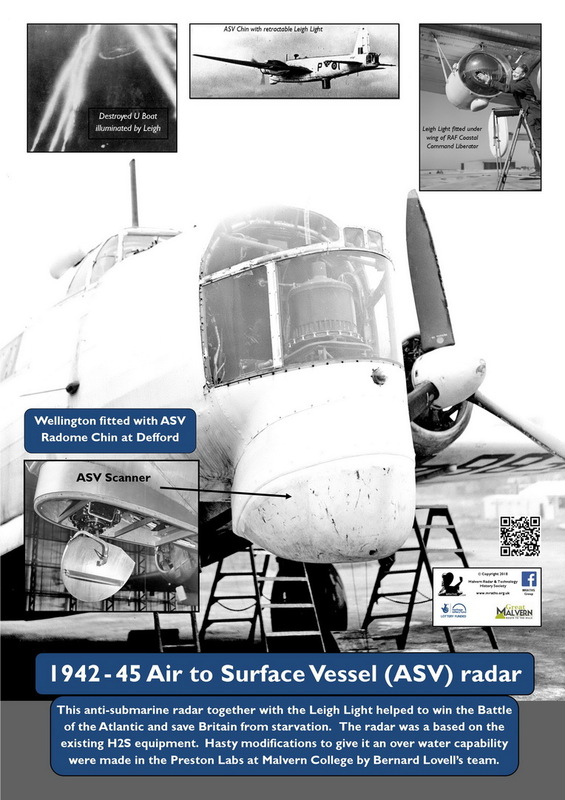 ASV aircraft of Coastal Command had been flying long wavelength search radars since 1941 based on original work at Bawdsey and this together with the invention, in 1942, of the Leigh light, a powerful searchlight used to illuminate U–boats at night, resulted in very heavy losses to the German submarine fleet. However, the German Navy countered these attacks with the invention of a receiver (METOX) that detected the transmissions from our aircraft. They were detected at long range well before the aircraft could find the U Boat, which then dived out of harm’s way. As a consequence few U-boats were sunk and shipping losses increased to unprecedented proportions at the beginning of 1943, threatening widespread food shortages. Bernard Lovell, who had been put in charge of the H2S navigation/bombing radar work at TRE Malvern, realised that a suitably modified variant of H2S for ASV purposes would improve accuracy and not be detected by METOX due to the use of centimetric frequencies. Seven H2S sets were modified in the Preston laboratories at Malvern College for installation in Maritime Wellington aircraft. 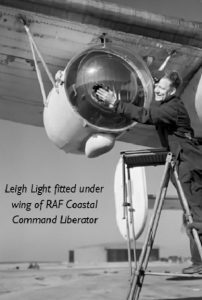 This was controversial as it meant that the development work that had been carried out on a specific ASV radar intended for Coastal Command had to stop. There was a bitter conflict between the Bomber and Coastal Commands as to who should get priority for the new radar. The Bombers won in the end, but a modified H2S for ASV was tested at Defford and finally fitted in the chin of Coastal Command Wellington aircraft for testing and it proved successful. This in conjunction with the Leigh light in a retractable dustbin type housing resulted in a massive increase of submarines been sunk in the spring of 1943 just in time to reduce the critical food shortages. The Germans did later recognise that a new radar at a higher frequency was being deployed and produced a receiver (NAXOS) to be able to detect it. However, unknown to the Allies, it was not very successful as it had a very short detection range. The obvious answer was to try and accelerate the development of a higher frequency H2S/ASV radar, but resources were very limited and TRE devised a simple interim solution. The power output of the magnetron was increased and an attenuator fitted so that as soon as the U-Boat was first detected, the power was turned down while still maintaining contact. The reduction in power detected by NAXOS appeared to show that the aircraft was flying away and therefore not a threat. The American higher frequency radar H2X came into service towards the end of the war, but by that time the U-Boat threat had been neutralised by overrunning their bases.